Who invented the Zipper? The name of the person credited with inventing the Zipper is Gideon Sundback (1880 - 1954). Gideon Sundback is not only famous as the Swedish-American inventor of the Zipper but also as a businessman and electrical engineer. When was the Zipper invented? Gideon Sundback invented the Zipper in 1913, during the Second US Industrial Revolution / Victorian period of invention (1850 - 1914). Gideon Sundback was issued with patent number 1,060,378 (US) for the "Seperable Fastener" on April 29, 1913. Definition of the Zipper: The Zipper is defined as a fastening device for interlocking two sets of toothed edges by means of a sliding tab that opens and closes the teeth when pulled. The purpose is to join or separate pieces of clothes, textiles, leather, and other materials when the zipper is opened or closed. Fact 1: Who invented the Zipper? Prior to the invention of the Zipper by Gideon Sundback in 1913, clothes fasteners consisted of bone needles, laces, ties, leather girdles or belts, brooches, hooks and buttons. All of the fasteners were time consuming and fiddly and required two hands to fasten items of clothing. Fact 2: Who invented the Zipper? The Zipper, originally the "Seperable Fastener" was invented by Gideon Sundback in 1913 during the Second US Industrial Revolution era of inventions (1850 - 1914), a useful addition in the area of Clothing and Apparel. But other inventors had previously attempted to create a clothes fastener. Fact 3: Who invented the Zipper? In 1846 Elias Howe patented the world's first practical Sewing Machine and in 1851 received a patent for an "Automatic, Continuous Clothing Closure" but the device was more like an elaborate drawstring than a true slide fastener. Elias Howe clearly recognized the need to create a new type of clothes fastener but did not seriously try to market it. Fact 4: Who invented the Zipper? American inventor Whitcomb L. Judson (March 7, 1846 – December 7, 1909) designed a "Clasp locker or unlocker for shoes" device to speed up the tedious task of fastening the high-button boots that were in fashion at the time. Whitcomb L. Judson received patent number US 504038 A on 29 August, 1893 for his invention for "automatically engaging or disengaging an entire series of clasps by a single continuous movement". Fact 5: Who invented the Zipper? However, Whitcomb L. Judson's invention was more like an elaborate drawstring than a true slide fastener. He introduced his invention of the "Clasp locker or unlocker for shoes" at the 1893 Chicago World's Fair, aka the World's Columbian Exposition, but the fastener kept popping open. Fact 7: Who invented the Zipper? In 1906 a Swedish-American electrical engineer called Gideon Sundback was hired to work for the company. Whitcomb L. Judson died in 1909 and it was Gideon Sundback, still working for the Automatic Hook & Eye Co., that became determined to work on the development of the fastener. It was Gideon Sundback who invented the zipper. Fact 8: Who invented the Zipper? The inventor of the Zipper, Gideon Sundback, was born on April 24, 1880 in Jonkoping Municipality, Smaland, Sweden and died on June 21, 1954. Fact 10: Who invented the Zipper? In 1905, Gideon Sundback emigrated to the United States and found work at Westinghouse Electric and Manufacturing Company in Pittsburgh, Pennsylvania. Fact 11: Who invented the Zipper? In 1906 he was hired to work for the Automatic Hook & Eye Co. owned by Whitcomb L. Judson. The "C-curity" clasp-locker fastener had not been a success for the company but other inventors had seen the gap in the market for a new type of fastener and Gideon Sundback believed in the great potential of the product. Fact 12: Who invented the Zipper? Whitcomb L. Judson died in 1909 and Gideon Sundback, now the chief engineer at the Automatic Hook & Eye Co., was determined to work on the development of the fastener. Fact 13: Who invented the Zipper? Gideon Sundback developed a new product called the Plako but the fastener had problems and would pop open and the get stuck in the position. The Plako was another failure. Fact 14: Who invented the Zipper? The hooks were the elements that caused the malfunction so Gideon Sundback began working on a way to eliminate hooks altogether. His next design had clasps on one side that fitted over a bead on the other side with a slider to open and close the device, it was a "Hookless Fastener". Fact 15: Who invented the Zipper? 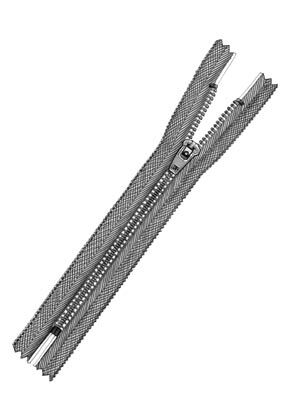 On April 29, 1913 Gideon Sundback, assigned by the Automatic Hook & Eye Co., was issued with patent number 1,060,378 (US) for the "Seperable Fastener", also referred to as the "Hookless Fastener", which was the forerunner to the modern zipper. Fact 16: Who invented the Zipper? The new product achieved moderate success during WW1 (1914 - 1918) when hookless fasteners were sewn into flying suits to make them windproof. However it was their inclusion in tobacco pouches and boots that proved commercially successful. Fact 17: Who invented the Zipper? The name 'zipper' was created in 1923 by the B.F. Goodrich company, who used the device on their new boots. The origin of the word 'zipper' reflected the meaning of the word 'zip' meaning to "move rapidly". Fact 18: Who invented the Zipper? Retailers in the clothing industry were prone to sticking with traditional materials and design methods and were slow to incorporate the zipper into their designs. The zipper eventually placed button in men's trousers in 1927. Zippers did not become common in women's dresses until the late 1930s. The famous fashion designer, Elsa Schiaparelli, led the way choosing zippers to set her designs of 1935. Fact 19: Who invented the Zipper? By the 1940's the zipper was in widespread use and WW2 (1939 - 1940) saw the inclusion of zippers in military uniforms. Fact 20: Who invented the Zipper? By the 1950s, the zipper was the default fastener for everything from purses, shoes, wallets, backpacks to all types of clothes. The invention of Velcro by George de Mestral invented Velcro which followed the zipper as another type of fastener in 1948. Fact 21: Who invented the Zipper? Gideon Sundback died of a heart condition on June 21, 1954 and was interred at Greendale Cemetery in Meadville, Pennsylvania. His name will always be remembered as the inventor of the zipper.